The complete text of A policy for secondary education is shown in this single web page. Page 7, line 30: delete 'only 8 per cent or 9 per cent' and insert '20 per cent'. This error has been corrected in the text presented here. 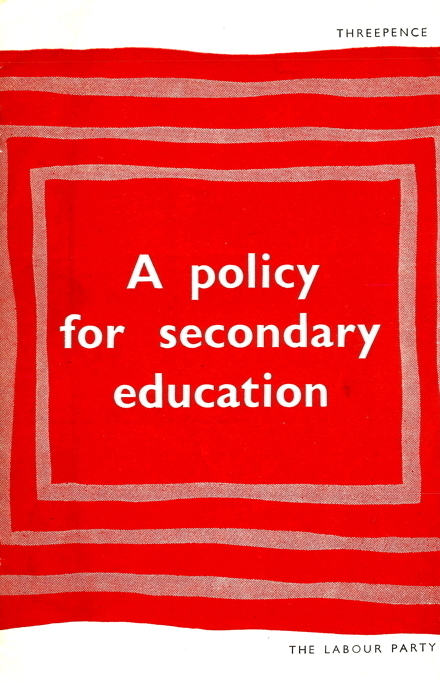 A policy for secondary education was prepared for the web by Derek Gillard and uploaded on 18 February 2017. THE ANNUAL CONFERENCE of the Labour Party meeting in Margate in October 1950, passed the following resolution. This Conference calls upon the Government to implement the Labour Party's declared policy of the comprehensive school, in secondary education, and to ensure that the Ministry of Education do everything to assist those local education authorities who are including such schools in their development plans; and that, due regard being paid to local circumstances, permission to proceed with comprehensive schools be not withheld on grounds of size alone. After Annual Conference the National Executive Committee invited a sub-committee to prepare a report upon secondary education. Having received the report the National Executive Committee has decided that it should be published for the information and guidance of the Labour Movement. THERE IS a general agreement that the purpose of education is both to enable and to help the individual to grow to his full stature as a member of the community to which he belongs and to whose welfare he should contribute. The educational process cannot, in fact, be dissociated from the social philosophy with which it is contemporary. English education, in so far as it has been successful, has always both responded to, and contributed to, changes in the social order. During the last 20 or 30 years we have learned, somewhat painfully, that in our own time it is the intrinsic worth of the individual human being that needs emphasis. The Declaration of Human Rights gives international expression to this conviction, which must be the cardinal principle for education today. If this is to be the 'century of the common man', it must be made the century of the common child. As a nation we are advancing steadily towards full social democracy and are committed to the belief that all men are born equal; not that every child will grow to the same stature, but that every child must be given an equal opportunity of growing to his own full stature. The principle of equality of educational opportunity is inherent in a social democracy. It is, moreover, the 'whole man' with whom we must be concerned. There has been a tendency to confine attention to mental and physical growth and to neglect the potentialities for 'spiritual' or 'character' development, which is of equal importance to the community. problem for the teaching profession to solve, by finding means for reaching the slow group. What could be more undemocratic than to deprive some students of a solid education by shunting them off to shop courses? As for vocational training, more and more employers are showing a preference for candidates who have the breadth and adaptability gained from a liberal education. It is our view that the tri-partite system of education does not provide equality of educational opportunity, and is, therefore, out of tune with the needs of the day and with the aspirations of socialism. ORIGINALLY, the tri-partite system was never planned on educational lines but developed accidentally. It consists basically of three educational streams which are class divided in a way that reflects the social structure of the nineteenth century. At the highest level there is the grammar school stream which provides vocational instruction for entry into the learned professions. Only pupils from grammar schools have real hope of entering the professions or university. There is, secondly, the technical school stream which is a twentieth-century product. The function of vocational training was originally made clear by the conditions of entry which laid down that pupils would be trained to be artisans. In fact, this stream did not pick out the potential technicians but catered for the intermediate grades of children who were capable of and desired, more than the modern school education, but who failed to attain the grammar school stream. elementary modern schools which developed from the first provision of free universal education. 1. Secondary Grammar School; for clever children. 2. Secondary Technical School; for children with technical or commercial ability. 3. Secondary Modern School; for the rest. This aroused opposition from the Labour Movement generally, and from many educationalists. It was urged that comprehensive schools should be set up where all children over 11 could be taught under one roof and could find their own level. As a result of this pressure the 1944 Education Act made no mention of the three types of school, but laid the duty on local education authorities to provide efficient secondary education. This left the way open for comprehensive schools where local education authorities wished to establish them and where Ministerial sanction was forthcoming. Despite this it is still the case, in England and Wales at least, that children at the age of 11 are selected and segregated into the three streams of the tri-partite system. The three types of school are bound to inherit the old traditions of class segregation. This has two bad effects. It leaves some children resentfully concluding that they are inferior to children attending the grammar schools. And it can implant in the minds of grammar school pupils an assumption that they are superior to the rest. Even in a tri-partite system making its selections upon special qualifications and not upon wealth, this objection remains. On the contrary, we hold that school becomes colourful, rich and rewarding just in proportion as the boy who reads Homer, the boy who makes wireless sets and the boy without marked aptitude for either, are within its living unity a constant stimulus and supplement one to another. The tri-partite system involves some method of selection at an early age. It is this that gives rise to many of the more trenchant objections to the tripartite system. Selection of children at about 11 or less for different types of education is based upon the claim that it is possible at this age to determine the limit of future mental growth. Few would pretend to be able to predetermine the limit of physical growth where nutrition and environment matter so much. No one would be bold enough to assess the future development of character, which is so susceptible to experience. But it is assumed that future mental development can be projected. Recent research into the accuracy of this kind of prediction, if it has not indeed thrown grave doubts on the validity of testing, has at least indicated that the margin of error is considerable. No appreciable margin of error can be tolerated where decisions are to be made of such vital importance to human beings. is that human beings are educable and modifiable and that prediction is therefore hazardous due to the variability of human growth. It is wrong therefore, to base a child's future education and subsequent career upon any form of test taken at this early age. A child who is anxious to be selected but who fails the test feels his failing deeply, and this is accentuated by his parents' natural concern at his failure. Selection at 11 has meant, too, that primary schools are tending more and more to measure their success by the number of pupils who reach the grammar school. The primary schools have thus, in fact, become cramming schools in which children are not educated in the liberal sense of the word, but are trained to face the competitive hurdle of English and arithmetic tests and intelligence tests. Many schools practise their children in intelligence tests. As a result they may be developing an unreal aptitude for them which defeats its object. If the primary schools were freed from this pressure they would be able to adopt a more liberal education policy by which the percentage of educable might well be increased. It is also true that, given the present educational structure the nature of a child's education from 11 onwards is fortuitous rather than rational, and is based more on geography than ability. For example, in Carmarthen there are grammar school places for 50 per cent of the children, the average for Wales as a whole is 34 per cent, in north-west Kent there are places for only 20 per cent of the children. Thus, while segregation into the three streams is maintained, a child's chances will vary according to the percentage of grammar school places available in the different counties. grammar school stream. The fact that transference is feasible has been proved by the cases of the few children who have been transferred already. In theory, therefore, this system could work. In practice however, it is almost impossible. Grammar school teachers often resist the entry of 13-year-old modern school children who have, for the two previous years, been following a different curriculum which may leave them ill-equipped to start the third year of grammar school studies. It is also necessary that vacancies be created for the transferees, which means that the relative failures in the grammar school stream must face transfer to the secondary modern school. This if applied would have a very bad effect on the children concerned, and would certainly give them a sense of failure. The Education Act states that the wishes of the parents should be borne in mind when children are selected for the type of education they are to follow after the age of 11. In fact, parents' choice has not been fully effective. Parents appealing against non-selection for the grammar school or technical school have usually been overruled. On transfer from secondary grammar to secondary modern however, the parents' objections have usually been sustained. These objections do not necessarily apply to transfer between secondary modern and secondary technical which is in any case sometimes based on 13-year-old entry. The comprehensive school avoids all the above educational disadvantages and grave social injustices. tri-partite system with the three streams housed in one building or in separate buildings on one site. Clear sub-division of streams remains, however. The comprehensive school caters for all children through a system based on a central core of subjects common to all, from which branch classes in specialised subjects taken according to the desires, aptitudes and capacities of the children. Size: Provision must be made for sixth form education equivalent to that of the present grammar school. Organisation: The arrangements of numbers of classes catering for the specialised bents of the children should not be such as to make unreal demands on staffing and accommodation. Individual Guidance: There should be close individual guidance of each child throughout the school career. It is desirable that wherever possible a sixth form equivalent to that of the present grammar school should be an integral part of a comprehensive school. The minimum size of a comprehensive school with its own sixth form will depend upon the percentage of children in the normal intake who will go on beyond the school leaving certificate class. The present percentage varies considerably throughout the country. We feel it safe to assume though, that the comprehensive school will uncover a reserve of potential and actual sixth formers which would be above the present percentages. As in any case most sixth form work can be based on individual studies, it is not necessary to have a large sixth form element. Where, however, it will not be possible to carry a sixth form as an integral part of a comprehensive school, then it should be possible to provide a combined sixth form for several comprehensive schools. though, that these are only examples and the same principles can be applied to larger and smaller schools. It should be clearly understood that the comprehensive school is not necessarily a large school nor does it set out to provide mass education. It is a system of education which can, with minor variations, be applied to both small and large schools and which, in addition, provides all the facilities for the highest standard of pre-university education. comprehensive school in the rural areas would in no way increase the extent of travel, but would make available to rural children educational facilities equal to those of the towns. It is possible, however, that rural comprehensive schools would not all be able to carry a sixth form, in which case one school with a sixth form could be organised to cover several comprehensive schools in the area. The first two years would be diagnostic years, in which the curriculum would be at first a continuation of primary school with the possible addition of a foreign language in the first year. From the diagnostic years a picture of aptitude and capacity should emerge. Alternative A: Pupils could be graded according to interest, aptitude and ability into 'curriculum patterns', e.g. the 'modern' side with an emphasis on science including geography; the 'language' side with emphasis on modern languages; the 'classical' side with emphasis on the humanities including history; the 'arts' side with emphasis on art, music, and drama; the 'science' side with emphasis on practical skills. All these could be partially 'cross-setted' to suit the abilities of pupils. Alternative B: Pupils could be graded into 'ability patterns' on the basis of individual abilities in individual subjects. This presupposes complete cross-setting and neglects the fact that a student who intends ultimately to go to a university may have to approach a subject, in which he has little aptitude, from an angle quite different from that of the low-aptitude pupil, who is of generally inferior mental ability and will not wish to pursue his studies academically. These alternatives are put forward merely as examples and suggestions. Schools will obviously work out their own detailed methods. We are not trying here to limit the initiative of teachers. is quite feasible and no more difficult than time-tabling for an ordinary secondary school. There should be close individual guidance of the child throughout school life. This, it is suggested, should be based on the tutor and house system, in which a child from entry to leaving school would be supervised by a personal tutor. The tutor should meet his charges twice a day. He should consult with parents, supervise the selection of study courses and generally break down the remoteness of a big school. The tutor should be responsible for his group to the housemaster, and should keep up cumulative records and reports. Personal tutors could be grouped into house systems, each house being a cross section of the intelligence of the school. Children should remain in the same house from entry until leaving. UNTIL IT IS possible to build new schools the comprehensive school system would have to make use of the existing school buildings. In many cases it would be possible to provide the necessary places by addition to, or adaptation of, existing buildings and this should not involve large capital expenditure. It may also be possible to provide units by redeployment of schools in a locality. Alternatively, the two diagnostic years could be housed separately as a lower school. Similarly, where it is not possible to create a unit large enough to carry its own sixth form, it should be possible to provide a combined sixth form for several comprehensive schools. This is not a desirable solution, but it may be dictated by circumstances particularly in the rural areas. It is thought that initial difficulties in integrating the work of teachers with different qualifications should not be impossible to overcome. It is inevitable, however, that the evolution of this new system would make new demands on school teachers. But there is every reason to believe that they would be able, and willing, to rise to these demands. The Education Act of 1944 requires that each child shall be given an education suited to his age, ability and aptitude. This requirement is not restricted to a particular moment in the child's life, but must have continued application. The internal organisation of the comprehensive school, the facilities it can offer, the way it is staffed, and the techniques employed must meet this requirement for the whole range of age, ability and aptitude. In our view, the teaching profession will be able to solve the technical problems involved. The desired end of a comprehensive school is that all children from an area, irrespective of class or wealth, should attend the same school. Clearly it is not possible to achieve this by the statutory abolition of fee-paying schools. These schools will probably vanish by a gradual process of attrition as parents increasingly send their children to the comprehensive schools. Parents who originally were, in theory at least, against the comprehensive school are now favouring it. Previously, before the implementation of the 1944 Act, they had been able to buy a grammar school education for a few pounds a term if their children failed to secure an examination place. Now that all places at this type of school are allotted according to merit, they are finding either that they have to forego hopes of a grammar school education altogether, or pay much higher fees to the remaining fee-paying schools. It is easy to accept the general truth that only a certain proportion of children are capable of profiting by a certain type and range of secondary education; but it is very hard for any of us to admit the particular truth, the galling truth, that our own boy or girl is one of those who are not. Can we then expect that the best type of working-class parents, earnest, provident and properly ambitious, will readily acquiesce in what they regard as a slamming of the door of opportunity at the very outset? They have their own estimate of the youngster who, in the home and at play, shows so much liveliness and capability, and so the attitude of the school authorities seems the veriest unreason. Against the evidence of school records and test scores they set their own faith and ambitions-and that argument which, though it be nine parts wishful thinking, yet contains a residuum of truth that their boy might be the exceptional case and that 'you never can quite tell how a child will turn out'. Moreover, the resentment of the parent at the refusal of choice of school is sharpened by the knowledge that this selection procedure is not applied consistently throughout the whole social range. He notes that the economically more favoured sections of the community secure by payment of fees precisely what is denied to himself, the right to ignore the educational verdict at 11 and send his child to the school of his choice, to follow a curriculum that promises to lead to the more desired kinds of career. It is important in securing parental confidence to build up the prestige of the comprehensive school. One important factor in this is the school's relationship with its governing authority. At present too many local authorities are grouping schools under a common board of governors. It is essential, in building up the identity of a school, that it should have its own board of governors meeting on the school premises. AT PRESENT local education authorities have power to select the type of school to be developed within their area, subject to approval by the Ministry of Education in England and the Department of Education for Scotland. This local autonomy should be preserved. It would be wrong to impose a pattern of education upon local authorities. It is felt though, that more could be done, given greater understanding and knowledge of the issues involved, than has been achieved in the past few years, great though the advances have been in many directions. It is hoped that this report will clarify the issues and give the impetus towards the creation of an educational system which will give equality of opportunity and status to all.